Want to write great short stories? Have too many ideas to put into words? Stories that don't quite take shape? Always wanted to write a story, but don't know where to begin? Consider this class a boot camp for the short story writer. Steve Weddle is the author of the novel-in-stories Country Hardball—called "downright dazzling" by the New York Times—and editor of the award-winning short fiction magazine Needle: A Magazine of Noir. And in four weeks, he'll teach you how to write compelling, original short fiction (with skills applicable to longer works of fiction, too). This class will give the opportunity to hone your skills, using your voice and vision as you craft vibrant, original fiction ready for publication. Through weekly readings, lectures and assignments, this class will delve into character, dialogue, setting, and plot and will provide you with a range of techniques as you continue to craft your own stories. Week 1 - Start with Character: Who? Why should a story lead with character? What can we tell about a character from dialogue, details, and setting? What sort of character carries the story? What makes your character unique, unexpected? We will look at who the main character is, how the words chosen work to define character. We will work on dialogue chunks, varying word choice and tone to get at the voice and vision you have for this story. Week 2 - Weave the Plot: What? What is your story's story? What happens? What twists and turns does your story take? What happens if your story takes a turn the reader doesn't expect? We'll explore stories with expected twists that prove inevitable, stories with plot layers that increase our understanding of the character. What is the secondary layer to your story? What are the tensions on each page, the conflict pushing the story forward? What is at stake for your character? We'll build on our first week, combining character with plot by examining the role of secondary characters in the storyline. What does the spouse, the partner add to the story? Week 3 - The Air Around Us: Where? We will look at setting, not just the name of the place, but the feel of the world. We will look at the language you use, the dialogue we have been working on. What does your character's understanding of the world around her tell us about her? What can we learn from the descriptions of the place? The smells? The folded scrap of paper used to even up the table leg? We will use our understanding of character, plot, and setting to show the story at multiple levels, to have the reader meet us half-way, invested in our telling. Week 4 - The Inevitable Truth: How? We will work on the sculpture of your writing, tearing away everything that isn't your story. We will focus on what your story has become, building up the layers, the pieces that support your story. We will work line by line to enhance the threads running through your story, the glimpses of details, the quirks of character that add up to a finished story. Your story will become the truest piece it can, stripped away of excess and held together by its own theme, the threads and layers of character, plot, and setting that we have spent a month creating. You will complete this class with a finished, publishable story in hand, and a skillset to craft your own fiction with compelling characters, rewarding plot, and telling setting. You will be able to understand and use the best contemporary storytelling techniques, learned through our carefully cultivated weekly readings. You will be able to move forward, using these techniques to enhance your own voice and vision. You will have raised your own standards for writing, working with classmates and the instructor through detailed discussion and line edits of your manuscript. 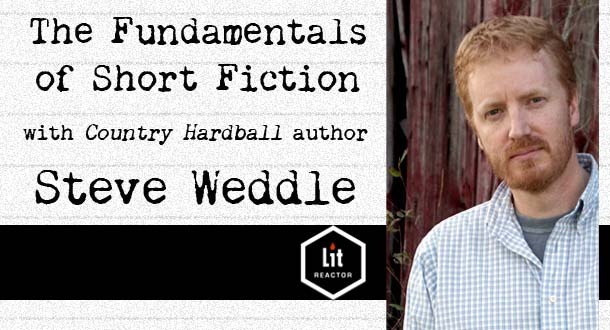 "Steve Weddle is an entertaining, poignant, and expert teacher of the fundamentals of short fiction. Steve provides instruction in how to create architecture for your narrative and guides the writer to fully realize character, setting, dialogue, and outcome. In writing, we are constantly telling one another and hearing from one another "show don't tell." When I took Steve Weddle's class he excellently showed, through the selection of the short stories that we read, how to elegantly maximize each of the fundamentals of short fiction. Because of his class, I have clearer direction and motivation when I write short stories. The short story I workshopped in Steve's class won First Prize in short fiction in the Texas Health Resources Literature and Medicine contest." —Jessica H.
"[Steve] gave us excellent insight into the publishing process and provided insightful, helpful critiques. I appreciated the balance between candor and care. His ability to respond to such a wide variety of genres was impressive and, of course, I liked learning about his area of expertise." —Wendy H.
"Steve's class was an awesome hands-on approach to the process of writing for publishing. I learned a lot about how to set myself up for more success in my writing." —Mark D.
"Steve is an attentive teacher who gives a great behind-the-scenes look at short story publishing. It’s a quick class, but in that time the lessons and assignments helped me polish my story and cover letter. He had lots of great tips for what editors look for and helped decode some of the more hazy aspects of submission guidelines. The story I worked on in this class had been rejected a few times, and I was considering sticking it in the trunk. After the class, it was picked up at the next place I sent it." —Sarah R.